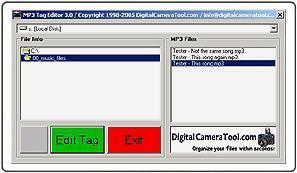 A solution to your worst digital camera and downloaded files nightmare! This software will save you time, effort and help you organize your files the easy way. Works with ALL Versions of Windows Only. Many new features have been added and other features remain the same as earlier versions. © 1998 - 2099 digitalcameratools.com - Digital Camera Tool Inc., All Rights Reserved.